Last week I had the absolute pleasure of meeting Katlyn Lacoste, right here in Vancouver. Katlyn came here as part of a modeling tour of the Pacific Northwest. Using the usual channels, she booked to work with my dear friend and constant collaborator Fred Fraser. Imagine my surprise when Fred messaged me to ask “do you know who Katlyn Lacoste is?” only to find I had been looking at photos of her (by the one and only Chip Willis) all week! In person, Katyln is petite and unhurried. When I arrived at Fred’s house she was curled up in a chair in the backyard, wearing sweatpants and a denim button up. I came in like a hurricane, still reeling from the many stops, and meetings I’d had that day. Katlyn accepted my arrival with a smile, smoking slowly, and making small but emphatic gestures as she spoke. This gentle cadence was replaced with a powerful energy and dynamic modeling, the second the camera came into the picture, but more on that in a moment. Fred shot Katlyn in an incredible set piece he had been working on for some days. I was lucky enough to catch the process both before, during and after. 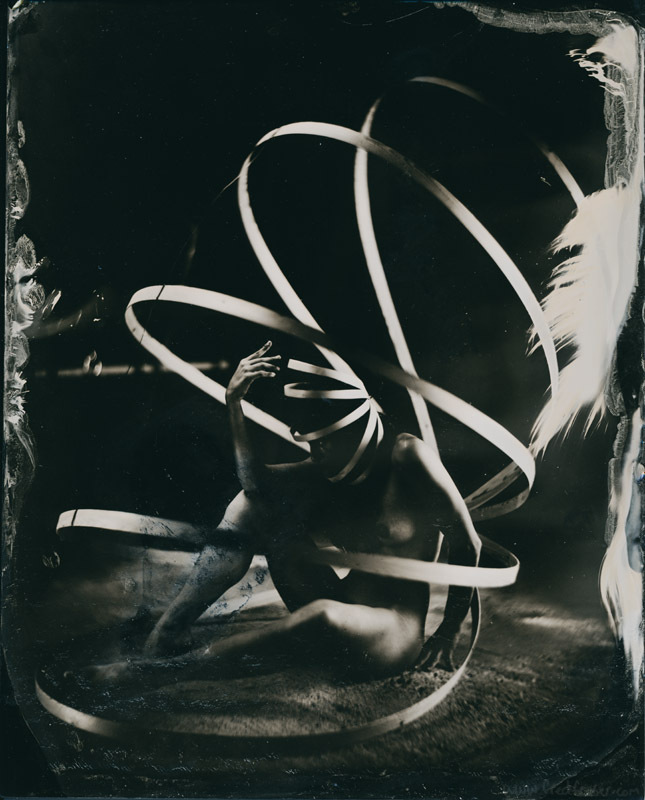 The resulting image is scanned from the original wet plate. The artist, shapes, model, and the medium blended to create an incredible photo that will be included in the upcoming “XOXO Erotica: Art, Love, and the Internet” show in Vancouver, on September 21st. Not only is Katlyn a captivating, and fearless model, she is also a talented visual artist. When I asked her to elaborate on her many creative contributions, she said she paints because she loves it, and she models to make money. “Driven, and talented!” I thought, it’s no wonder she is so successful. The balance she has achieved between the art she creates, and the art she inspires is sheer perfection.